I love seeing how organizations use social media in their daily interactions. Most of the time it’s positive, informative, and engaging. Every now and then I shake my head and want a direct line to whoever is in charge so I can beg to let me help them. I feel this way with the Girl Scouts. My older daughter was in Girl Scouts (GS) for five years. I think. Maybe six? I don’t know, it’s all a sugar-induced cookie blur. Back when she was first involved, marketing via social media was just taking off. I don’t think GS even had a Facebook page, much less a Twitter account. Parents were still fearful of the online world, so online selling was not happening. I remember tweeting about cookie booths to hopefully drive some extra sales our way, and my daughter would send an email to family letting them know she was selling. At the booths, the most frustrating thing to me was only taking cash and checks. With so many avenues open to take people’s money, why wasn’t GS getting on board? Jump to a couple of years ago. Brands by now are now extremely relevant online, and GS moved forward with the times. They even opened up online ordering via individual websites for the girls. However, you could still only order. They still did not take credit card payments, and you couldn’t use other resources for payment like PayPal. Honestly, it wasn’t a terrible system. Most cookie sales come from people in the town you live in. You still have to deliver the boxes of cookies, so you can be paid in person when you deliver. If you get a lot of orders from out of state, that makes it more difficult to deliver, because now you have a shipping charge, etc. It’s just a hassle that GS hasn’t worked out yet. This year I’m told they are taking credit card payments at cookie booths- which is a big step forward. I am one of those people who almost never has cash on her, so I would definitely be more likely to buy cookies! There is still a side of GS cookie season that a lot of people do not realize, and that is donations. GS troops always send boxes of cookies to troops overseas, as well as to shelters and fire/police stations in their area. It’s the troop care packages which brings me to the point of this post- because this week a scout did a big no-no while talking about this very thing online. The 11-year-old was part of a Twitter Chat, and was telling everyone about their project for sending cookies to troops, and also gave a link to a PayPal account for donations. It was informative, and a great business strategy. So great in fact that a mom from her own troop ratted her out to the higher-ups, which prompted a public twitter-scolding by GS (see the link for the whole scoop). In fairness, no, she could not have a PayPal account. It’s not one of their allowed methods of payment. I’m not going to dive into the personal stuff about tattling. Some GS troops are way more competitive than others. What bothers me is the thinking that the way to teach girls about business is simply to sell door-to-door and in front of stores. Yes, they have made strides, but it’s a disservice to limit how people can pay. When you limit how people can pay, you limit the creativity in how the girls can sell cookies. Why bother chatting online about troop donations if the only way they can donate is to mail a check? Are you going to mail a check to some stranger? Is that Scout’s parents really going to want to give their address out online? I think not. I understand wanting to teach girls how to handle money. It’s important, definitely. It’s important to teach them how to build confidence in themselves too, which is why they encourage door-to-door and store front selling. But let’s be honest. I have Girl Scouts in my neighborhood, no one has come by to sell to me. How many of you have taken the order form to work, or have been approached not by the child, but by the parent wanting sales? We also promote online for our children who are too young to have Facebook pages and Twitter accounts, as well as for those who do have their own social media accounts. The majority of the selling by the girls seem to come from cookie booths. Trust me, this isn’t a critique of Girl Scouts. I love GS and their Girl Power message. Although my daughter needed to leave the troop for time-organizational reasons, the years she spent as a scout are invaluable, and will serve her well for the rest of her life. My critique is in their old-business way of thinking. They have made progress with online promoting, website ordering (but not payment) and now allowing credit card payment. There is even an app to find cookies! These methods do help cookie addicts buyers find their cookies, but I feel they are still holding girls back by not fully embracing methods of payment. So much more creativity and forward-thinking can be encouraged in these girls, if the Girl Scouts would just forward their own a little faster than they have been. How Does Satirical News Cross A Line? 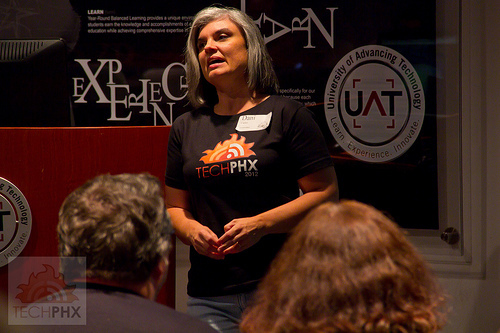 The Tech Phx Planning Season Is On!